This is a replica of the right hand of Tyrannosaurus rex. When Tyrannosaurus rex was first discovered, the humerus was the only element of the forelimb known. For the initial mounted skeleton as seen by the public in 1915, Osborn substituted longer, three-fingered forelimbs like those of Allosaurus. 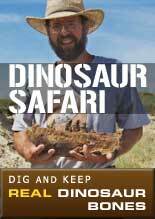 However, a year earlier, Lawrence Lambe described the short, two-fingered forelimbs of the closely related Gorgosaurus. This strongly suggested that Tyrannosaurus rex had similar forelimbs, but this hypothesis was not confirmed until the first complete Tyrannosaurus rex forelimbs were identified in 1989, belonging to MOR 555 (the "Wankel rex"). 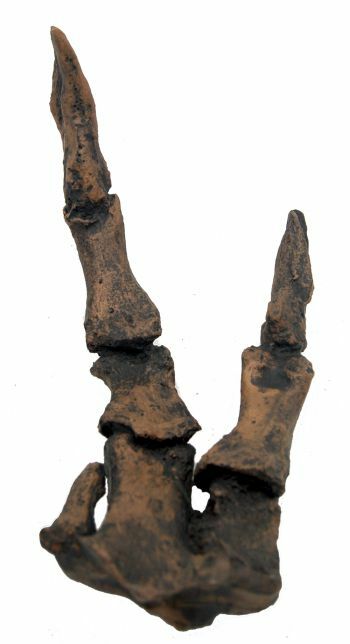 The remains of Sue also include complete forelimbs. Tyrannosaurus rex arms are very small relative to overall body size, measuring only 1 meter (3.3 feet) long, and some scholars have labelled them as vestigial. However, the bones show large areas for muscle attachment, indicating considerable strength. This was recognized as early as 1906 by Osborn, who speculated that the forelimbs may have been used to grasp a mate during copulation. It has also been suggested that the forelimbs were used to assist the animal in rising from a prone position.